Greetings from one of the most exciting bands on the scene in Eastern Iowa! B.T.A. consists of nine of the area's finest musicians, bringing you the music of CHICAGO, BLOOD SWEAT & TEARS, STEVIE WONDER and many others. Please feel free to browse our website. Thanks for visiting! CLICK HERE to view the March 2015 issue of the LCBS newsletter, which includes a review of BTA's show at the CR Library. Rob Wallace (Vocals, Percussion) - Rob Wallace has extensive experience as a lead vocalist on the eastern Iowa music scene for over 20 years, and has fronted several popular eastern Iowa bands including Stranded in Iowa, Jampact, The Toys and Strange Exchange. Rob lived in Los Angeles in the mid 80's, fronting vocals for an aspiring L.A. rock band to a record contract. In the early 90's Rob made his way to Nashville, recording background vocals for several studios and recording his original songs with several Nashville up and coming artists including back up band members for veterans Susie Bogus and Wynonna Judd. Rob will bring his distinctive vocal talents to sing the rock, country and R&B songs people want to hear and dance to in eastern Iowa. Peter Hart (Saxophones, Flute) - Peter Hart holds a Bachelor's degree in Saxophone Performance from The University of Wisconsin-Madison, and a Master's degree in Saxophone Performance from the Eastman School of Music. He also holds a degree in band instrument repair from Minnesota State College - Southeast Technical in Red Wing, Minnesota. For three years, Peter had the opportunity to play for many touring shows while working as a musician on the S.S. Norway cruise ship. While on land he has worked with many eminent artists as well, backing up the likes of Ray Charles, Louie Bellson, The Temptations, The Supremes, The Fifth Dimension, Diahann Carroll, Vic Damone, Clark Terry and many others. He has also worked in the pit orchestras of many touring broadway shows such as Grease, A Chorus Line, Chicago, Grand Hotel and more. He currently repairs band instruments for West Music in Marion and loves to perform any chance he gets. Scott Vogelgesang (Trumpet, Flugelhorn) - A native of Minnesota, Scott moved to Iowa City in 1995 from Washington D.C. after a stint in the United States Army. He studied trumpet and played in the jazz band, concert band, subbed in the orchestra, a jazz quintet and played polka gigs on the weekends at the University of Minnesota in Duluth. 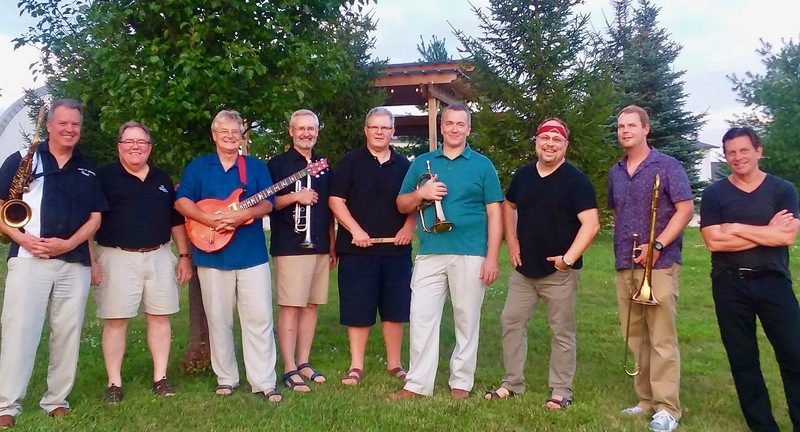 Scott works at the University of Iowa and performs with several ensembles in eastern Iowa including: Motherlode, The Iowa Vanguard Jazz Collective, Sunday Evening Brass Quintet, the Ottumwa Symphony Orchestra, New Venue Big Band and Brass Transit Authority. Greg Young (Trumpet, Flugelhorn, Trombone, Vocals) - Greg Young has been playing brass instruments for over 35 years. Starting on the trombone in 5th grade like everyone else (right? ), he picked up the other horns along the way, adding trumpet, valve trombone, baritone, euphonium and french horn in high school, and tuba in college as a member of the Hawkeye Marching Band sousaphone section. Over the years, he has had the good fortune to back some prominent musicians and bands, including Clark Terry, Steve Turre, The Buckinghams and Sonny Geraci, and has played with local bands The Fez, The Salsa Band, Salsa Vibe, Jif and the Choosy Mothers, The Iowa Vanguard Jazz Collective, The New Venue Big Band and The Cedar Rapids Municipal Band. Matt Driscoll (Trombone) - Matthew Driscoll has a Doctor of Musical Arts degree in Trombone Performance and Pedagogy from the University of Iowa, and is currently adjunct low brass instructor at Central College and Cornell College. In addition, Driscoll teaches part-time elementary band at Bennett Elementary. Before moving to Iowa he taught as an elementary music instructor and middle school band director in Tennessee. Driscoll has played principal trombone with the Waterloo-Cedar Falls Symphony Orchestra and has performed with the Cedar Rapids, Des Moines, Quad City, and Gadsden (AL) Symphonies. He has been a featured soloist with The Eastern Iowa Brass Band (where he served as the principal trombonist for over four years), the Central College Symphonic Wind Ensemble (SWE), and was featured as a soloist at the Northeast Alabama Bonefest in 2001. Denny Redmond (Keyboards) - Denny received his Bachelor's degree in Music Composition and Theory from Coe College in 1976 and his Bachelor of Arts Degree in Accounting from Coe in 1988. His musical career started in high school with a band called Change of Pace in 1968 and spent a good portion of his formative years playing at a bar called Polly's Penthouse. He played with Gage Memorial, a nine-piece brass band, from 1972 to 1974 and with Websterjon from 1974-1976. Then, on a full time basis, he played with Source until late 1978. He is currently a partner/principal in the CPA firm Latta, Harris, Hanon & Penningroth, LLP, and plays on a regular basis with The C.R. Jazz Big Band and the newly formed B.T.A. - Brass Transit Authority, a Chicago/Blood Sweat & Tears tribute band. John Reasoner (Guitar) - Growing up in Washington D.C., John started playing trumpet, keyboard and guitar in bands at the age of 12. At 16, he moved to Iowa and later attended the University of Iowa where he studied music and art. During this time, he ran the recording studios for the music department and performed with the University of Iowa jazz bands. From there, John hit the road for the next seven years, touring the country with various groups (Cabala, MeanStreet and the Hell Horns, Gambler, Express and many others). In 1985, John established School House Studios, where he began producing music scores and multimedia content. In 1994 he joined CMF&Z Ad Agency where he continued producing music and multimedia content. Christopher Bird (Bass, Vocals) - Christopher Bird teaches band at Harding Middle School, and tuba and euphonium at Coe College in Cedar Rapids. He plays in several ensembles around eastern Iowa including: Brass Transit Authority, Motherlode, Electric Mule, Holiday Road, The Eastern Iowa Brass Band, The Iowa Vanguard Jazz Collective and The Cedar Rapids Municipal Band. A native of western Pennsylvania, he received his Bachelor's Degree in Music Education from Indiana University of Pennsylvania, and his Master's Degree in Tuba Performance from Penn State University. Chris has performed in numerous and varied rock and jazz projects over the past 20 years. He has backed up many prominent artists including The Fifth Dimension, Eartha Kitt, Bob Mintzer, Marvin Stamm, Steve Houghton and Gary Burton. Truly dedicated to the concept of "In the pocket groove", Bird delivers a bottom that can still be felt well after the gig is over. After all, isn't that what it's all about anyway? Dennis McPartland (Drums, Vocals) - Dennis is a percussion specialist in drum set performance and jazz history, and has been involved in music since 1967 when he played his first professional job. He made an appearance at the 1977 Notre Dame Jazz Festival and then headed to Los Angeles, where he lived and performed until 1980. His performance credits include Steve Allen, Richie Cole, Duffy Jackson, Warren Hill, Mike Metheny, Bobby Watson, Louie Bellson, and Joe Lovano. Since returning to Iowa in 1980, he has been performing with The Daugherty-McPartland Group, Craig Erickson and his own groups. He toured Mexico in 1988 and was chosen as a cultural ambassador for the state of Iowa to Russia in 1991. He performed at the I.A.J.E. jazz conference in New Orleans in 2000. Dennis released his own solo project, "Off the Beaten Path", in Spring 2000. In addition to performing, Dennis provides in-depth drum set study and jazz history instruction for both students and band directors. He is also the director of a music program for the Iowa Arts Council entitled "Schoolhouse Jazz". Dennis is the percussion instructor at Kirkwood Community College and Indian Hills College. He has also taught at the University of Iowa and Cornell College. Dennis has a BA in Sociology, with a Minor in Music, and an MA in Music from the University of Iowa. This site was last updated on April 13th, 2019.